Regrets: Joanne Delage, Sherron MacPherson, Mary Haig-Brown, Bernie Bowker, Carmel Thomson, Woody Thomson. a. Update from Lana Popham – Chris Wieczorek, Executive Assistant to Lana Popham, Ministry of Agriculture. Chris plans to attend FTCW meetings when his schedule allows, is interested in Tod Flats developments, and the ‘Young Agrarians’ network for new and young ecological and organic farmers. Link: https://youngagrarians.org/about/ He will provide us with a status update re: Geothermal Loops in Saanich. 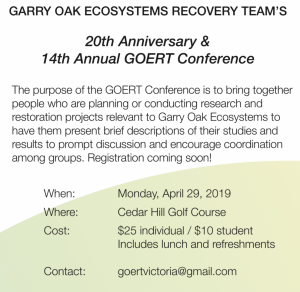 b. Gary Oak Ecosystem Recovery Team Restoration and Research Workshop. Hosted by Cowichan Valley Regional District. Mary & Winona attending, possibly more. The community workshop is a great opportunity for those passionate about salmon enhancement and stewardship to come together to share ideas, learn new skills, have fun and celebrate the accomplishments of the program and everyone who has played a role in the success of SEP over the past 42 years. See you there! Saanich grants seven environmental awards every year. Since 2000, they have recognized over 135 people and organizations that contribute to the natural environment in Saanich. The Awards are an initiative of the Saanich Environment and Natural Areas Advisory Committee (ENA). Nominations for the 2019 awards will open March 6th 2019.
g. Parksville 2019: 2nd Annual Vancouver Island Symposium on Water Stewardship in a Changing Climate. April 2-4, 2019. Location Parksville Community and Conference Center. Mary and Garth have registered for the conference; the group unanimously voted to reimburse them for the registration costs. 6. Water Quality Recording: March sampling: Thursday March 7th @ 1:00 pm, starting from Meadowbrook. 7. Logo Items – Possible logo items include stickers, cards and tattoos. Voted to hold for now. PIT tagged Coho will be released in March. PIT tags are very small chips which have been inserted into the bellies of the fry. There are three electronic arrays in the stream bed that will read the tags as the fish go over them either going out to sea or coming home to spawn in 2-3 years time. Each tag has a specific number that is recorded so we will know where each of the tagged fish was hatched (Goldstream Hatchery), when and where it was put into Tod Creek and when it goes out to sea and when it returns. The arrays are in the creek above Tod Flats, below Tod Flats and at the dam in Gowlland Tod Park. 9. Meeting with Elk Beaver Restoration Coordinator: Pat and Winona met with Jill Robinson, the new coordinator for the Elk Beaver Lake Restoration Project in January to share best practices. 10. South Prospect Lake Broom Pull: We are working with the Green Team to establish a date for the annual South Prospect Lake Broom Pull. on Saturday April 6th. 11. Heritage Society AGM for 2018 was held and two new projects have been established: we are working on a book to document the accomplishments of The Friends of Tod Creek Watershed under Mary’s leadership; and are collecting early editions of the Prospector, to be donated to the Saanich Archives. The group has access to copies of the David Gray documentaries on Tod Inlet and Chris will host a viewing at Lana Popham’s office meeting room [time and date to be posted when booked]. David Gray also has published a book with photos collected from the documentary research. The book is on order and if delivered in time will be available at the dvd viewing. 12. Mary Haig Brown Award Discussion: The committee will meet on March 20. Purpose: To recognize an individual for outstanding service in the restoration and protection of the Tod Creek Watershed. Criteria: Collaborates with and educates others to identify strategies and solutions for the protection and enhancement of the watershed; Demonstrates commitment, consistency and reliability to the projects undertaken by the FTCW; Approaches opportunities and issues with curiosity, integrity and collaboration; Shows initiative through leadership, hands on effort, advocacy, administrative work and/or support of others. 13. Website Update: Lori continues to expand the site and welcomes all input. 14. Maltby Lake Update: Carmel and Woody were unable to attend tonight. Thank you to Audrey for hosting our meeting. 3. Treasurers report: closing balance as of November 7, 2018 $494.68. 4. Correspondence: a thank you note was sent to Rob Wickson for meeting with the FOTCW regarding Saanich election. b) Gov’t of Canada SEP funding has produced “Salmonid Enhancement Program (SEP) Tod Creek Enhancement Plan.” This lays out a programme for Coho reintroduction in our watershed. Work has already started with some (300) smolts to be released with PIT tags enabling monitoring as they pass antenna in Tod Creek. Learn more on Tuesday evening, January 15 from Melissa Nottingham. Input for discussion topics has been requested. Winona will update the web site regarding where & time this meeting will take place. c) The Pugh Covenant located on the edge of the Tod Creek Watershed has been completed with local media interest providing positive coverage. d) The College of Applied Biology has released the report regarding the Ted Lea complaints. c) Whitehead Park: Saanich crews removed more yellow flag iris roots, mimulus has been planted, a successful work party was held on November 24 with cardboard and mulch spread on the west side of the creek. a) Water Quality Sampling continues with hope to add flow rates to our data. Peninsula Streams is interested in collecting data bank for streams within their operations. We now have over three years of information. c) Power to Be had a biophysical assessment done of their property. They sent us a copy, which Winona can send electronically. I have emailed Power to Be to request: we include them on our website under “Community Partners” and that I can put a link here to the assessment. e) CRD Watershed page –working on submission for inclusion of Tod Creek Watershed on CRD web page. f) Blue Green Algae: Jill Robinson, Elk Beaver Lake Initiatives Coordinator has contacted Pat about her photos of Blue Green Algae bloom submitted last year. g) Heritage Society: planning AGM early in January, notice will be sent out re when and where. the Heritage Society will show David R. Gray‘s videos: Beyond the Gardens’ Wall: The Immigrant Workers of Tod Inlet and [time permitting, or at a later meeting] Searching for the Sikhs of Tod Inlet. k) South Prospect Lake Broom Pull, April/ May: Mary will contact Green Team, and secure volunteers.